Maybe you think it’s time to be done with Carrie Fisher tributes, but you’re wrong. Since Carrie Fisher died in December, followed days later by her mother Debbie Reynolds, friends have come out of the woodwork to share funny stories and heartbreaking details about the wonderfully unique woman Fisher was. 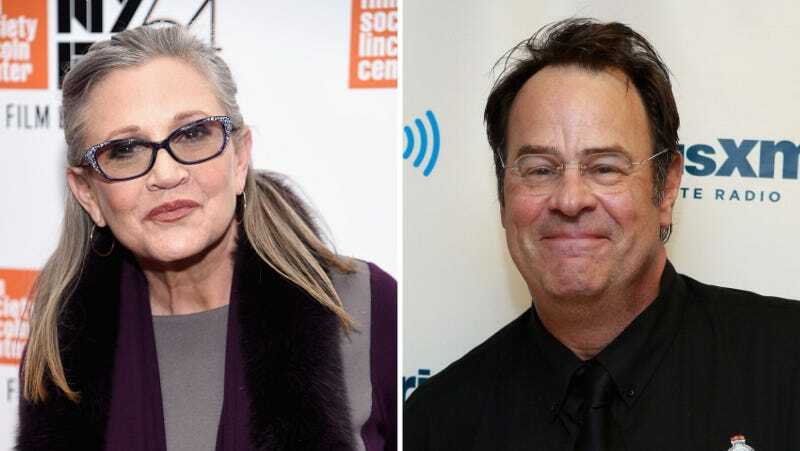 That includes her exes, amongst whose ranks stands Dan Aykroyd. In an article for Empire, Aykroyd wrote a somewhat poetic tribute to the time he spent with Fisher before she ended up with Paul Simon. While in Chicago we obtained blood tests for compatibility from an East Indian female doctor. Contemplating marriage, I gave Carrie a sapphire ring and subsequently in the romance she gave me a Donald Roller Wilson oil painting of a monkey in a blue dress next to a tiny floating pencil, which I kept for years until it began to frighten my children. One of the most brilliant and hilarious minds of our eon, Carrie would say things like: “I love tiny babies. When they cry they turn red and look like screaming tomatoes.” OR “This romance is finished the second you let out even a threep. I’ll be sick for a year.” AND “You have a jawline, hold your chin up otherwise you look like a tuna.” From then on I would identify myself on the phone as Tuna Neck. Despite the hallucinatory pleasure of Fisher’s company, Aykroyd put her on a plane to New York. He says they “had a great time,” but adds, “She was also in love with Paul Simon. She married him but I hope she kept my ring.” Carrie Fisher must have broken hearts in a way that felt almost as good as staying together.